How do you admire Jack Kerouac after you figure out that in the end he made horrible television appearances, hated his fans and fame and drank himself to death in his mother’s house? His friend Dean died drunk in a ditch in Mexico. I forget his real name. Burroughs probably wasted a Gastby’s worth of great novels on junk but never died and outlasted all comers. Bukowski was a drunk. Thompson a suicide. When you really come down to it, the Beat to admire is Allen Ginsberg. Like Burroughs he lasted forever, but unlike Burroughs he didn’t allow drugs to reduce his output or his international effect. He was a force to be reckoned with, not a former football player drinking himself to death. What was the real deal? Kerouac wrote about a spirit he didn’t possess or a spirit he once had? You read his books and are filled with a passion for another world, a world that now doesn’t exist, where you could bum from town to town and get decent jobs without identification and background checks and then be free to spend the money however you want in a multicolored galaxy of shanty towns that are now all converted into cemented over Walmart parking lots. You can have any color you like as long as it’s black - Henry Ford. 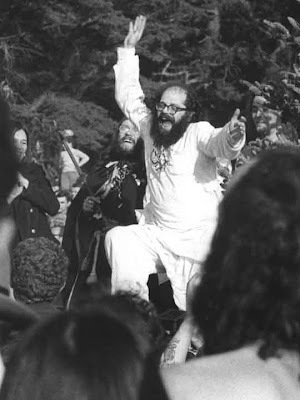 With Ginsberg there’s something different not only because his poem chronicled the entire group and encompassed a generation, but because he put on a sheet and traveled the world spreading his message and causing chaos wherever he went. He spent his time with the flower children on the bus and he also got kicked out of quite a few countries for simply expressing his true being. That’s power. Google search for Carlo Marx (Ginsberg) quotes from On The Road reminds me that the book is about to be raped by the movies, which they’re also doing again to Gatsby and I’m sure are lining up at Salinger’s grave to get to Catcher. Speaking of Salinger, where’s the extra books? Most disappointing literary non-event since Mark Twain’s autobiography (which is only disappointing because I have a copy and haven’t read it and my copy might be the wrong version).